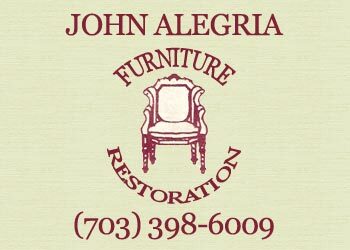 Furniture Restoration - Alegria Furniture Restoration. Chances are you came to this site because you have a Family Heirloom that needs caring for. Or maybe you're not quite sure if that "wooden thing" in the attic warrants restoring or should be used as kindling. Whatever the case I can help. I've been restoring antique and contemporary furniture since 1980 and in that time I've done all types of restoration - ranging from the simple repair to complex duplication of missing parts or fabrication of reproductions of classic antique pieces. No job is too big or too small. I understand that finding a reputable furniture restorer knowledgeable enough not to diminish the integrity of a piece with an inadequate repair is difficult. A general rule when restoring antique furniture is "less is more". I've seen far too many bad repairs that have only decreased the value of once beautiful pieces. When it comes to furniture I can honestly say that "they don't make 'em like they used to", and while I specialize in antique restoration I still take in many newer pieces that only confirm the limited standards that go into factory furniture of today. If you buy a new car or computer they're obsolete when you get them home. Collecting antique furniture is one of the few things that does not have forced obsolescence and therefore will only appreciate with time. Call or me and let's talk about your treasure!